A comfortable yet sophisticated "19th Hole" sports bar with casual American fare. 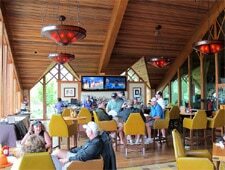 : Offering a full bar stocked with local brews, Brooks' Bar & Deck is a good place for golfers to relax after shooting 18 holes. The bar opens up to a large outdoor patio, presenting views of the greens and the lake. Entertainment is provided by multiple flat-screen TVs and electronic poker machines. Early risers will encounter a breakfast buffet that’s served until 11 a.m. in the summer. After that, the lunch and dinner menu kicks in with options such as tempura-battered calamari and the “summer breeze” salad, composed of spinach, arugula, papaya, grilled pears, strawberries, quinoa and goat cheese with a Champagne vinaigrette. Entrées include a veggie wrap, salmon fish ‘n’ chips, and a half-pound sirloin burger that can be topped with apple wood-smoked bacon, chili or guacamole.